It's two in the morning. Moonlight floods through the curtains, bright as dawn. Husband and myself are fork lifted from slumber by the sound of something large and cumbersome crashing against the porch door. "What in the name of almighty God is out there?" I ask. I stare at him, wild-eyed. He rubs a hand across his eyes. "Dunno. Too big for badgers." Then we hear a series of clickety-clack, clickety-clack hoof sounds across the gravel outside the window. Husband grins. "Got it. 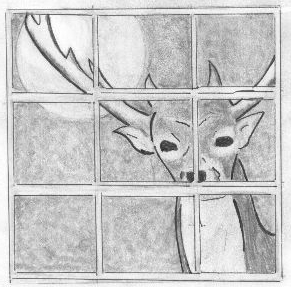 A stag’s antlers connecting with our porch window, because it didn't realize the glass was there." I get up and peer out the wood blinds. The December moonlíght outlines the barn, the lawn, and, beyond the trees, the steel-grey sea, shifting restlessly under the stars. No deer, though. I climb back into bed, grinning at the thought that five years ago, when we first moved to Donegal, we would have assumed that the disturbance was an attempted break-in, and gone around securing all the windows and doors in the house. Now we’re familiar enough with rural life to know that there’s always a weather- or creature-based explanation for night-time noises. The only thing you don't have to worry about are human intruders. Sure enough, the following morning, when Hugh the post-man comes tearing up the drive in his little green van, he informs us that he was stopped at the gates by the sight of a huge stag, chewing contentedly on the bark of a young spruce tree. The stag might as well enjoy our hospitality, along with the bats in the porch roof, the badgers who’ve tunnelled underneath the old ash tree, the dozen pairs of herons residing in the pine trees behind the kitchen garden, the family of foxes in the orchard, and the pheasants perching plumply in the arms of the sycamore tree by the garage. This is rural life, where you learn to share your space with all the species who fancy a coastal residence in the heartland of Donegal. Compared to our former lives in Dublin and Edinburgh, everyone rubs along together nicely here. At least you don't have to ask them to turn down their sound system or stop trashing their apartment at four a.m. The house we now live in is 180 years old, a sturdy double-storied building surrounded on three sides by the sea, and sheltered by the Cureen hill. It's situated across the bay from Dungloe town, the capital of The Rosses. The Rosses (Na Rosa in Irish), which means a series of peninsulas, stretches from the Gweebarra Bay northwest of Donegal town, up to the Crolly River, some five miles north of us. It’s rugged, rocky land, made beautiful by its spectacular shoreline, the Derryveagh mountains and the purple-heathered peak of Mount Errigal that can be seen from every point on all but the rainiest days. My father inherited this house from his aunt in the 1960's, and when they saw it for the first time on a wet autumn day, my parents fell in love with the whole idea of a country house on the shoreline. The ideal place to keep four children occupied all summer long. My mother saw herself packing a vast picnic hamper and setting off from Dublin in the train, with her excited brood clutching sea-side buckets and spades. The whole family boiled with enthusiasm all winter, aching for their first spring holiday in the heartland of Donegal. The enthusiasm faded somewhat when Ma discovered that the last train to Gweedore station left Dublin in 1947, due to stringent cut-backs. So she and Da had to drive the (then) seven hour trip on roads that deteriorated as they got nearer to the Rosses and finally disappeared into bog-tracks. There were other hitches: when the picturesque tide was out, it revealed a lethal raft of jagged rocks that would rip the bottom out of any boat attempting to leave the harbour, making fishing trips tough (my father surmounted this eventually by mapping and memorizing every single outcrop). Meanwhile Ma, skipping off to collect wild mushrooms in the fields, came back coated with bog-water to the waist, with a basket full of poisonous toadstools. "Don't even think about eating them," warned the local chemist, handing over a bottle of wine. (The pharmacy was the only outlet in town that sold wine back in the '60's, based on the sensible principle that you'd only imbibe alcohol of that sort for the good of your health. Guinness and whiskey you drank for pleasure, and were therefore on sale everywhere.) But if the adjustment from townie to country life had its pitfalls, my parents soon realised that the Rosses area and its people were pure gold. After living here for five years now, my husband and I can see that they still are. There are, of course, elements of culture shock in The Rosses for city slickers like us. There are still no trains travelling to Donegal. The Dublin train stops in Sligo, a whole county away. There are no late-night shops in town, no cinema, no theater, and although there are excellent local restaurants, the nearest shopping center is Letterkenny, about 40 miles away. On the other hand, there’s a surprisingly lively social life in the Rosses, ranging from music nights to arts festivals, where everyone seems to turn up at every event. My husband and I are both outdoors types, and the terrain here is ideal for mountain walking, angling, and swimming. Donegal, the most northerly county in the republic, has always had a tough time attracting steady employment. That means that almost everyone has had to emigrate for part of their working lives to the USA, England, or, most frequently, Scotland. It’s often said that the real capital of the Rosses is Glasgow. Links with Scotland are still evident in the daily language here: they call a road here a 'brae," and a lake is a “loch." A crying child is called a “greetin' wain," and if someone can't make up his mind about something he sayd "I'm swithering." It goes deeper than the vocabulary. People here have a distinctly northern outlook on life that might have been a challenge for my husband and myself, as native Dubliners, if we hadn't come here directly from Scotland. Dubliners are far more garrulous and openly curious about you. They’re quicker to presume friendship, quicker to take slight at something, and are imbued with a certain cockiness. Donegal folk, on the other hand, are more restrained. They don’t assume a friendship before time has built one up. I see them as realists, equipped with a dry wit and good-natured temperament. Because so many Rosses people have spent time in other countries, they have an easy-going attitude toward “settlers" like ourselves. You’re made feel welcome, without anyone having to overstate the case. northwest enjoys much milder winters than east-coast Dublin (or Edinburgh), and we’ve now turned into gardening fans, with the back and shoulder muscles to prove it. Despite the unpromising-looking granite and heather-covered ground, the quality of the soil is good, and five years on we have our own yield of potatoes, with more than thirty salad and root vegetables each season, including American corn on the cob, which thrives in this terrain. The sea behind the house has its own harvest. I often go down to the strand at low-tide with a bucket to collect a “feed" of mussels. The nearby beach of Traigheanna is a good razor fish source. It’s traditional to harvest them on nights when the moon is full, when it’s easier to grab these shy creatures. One of the most pleasant Sunday evenings you can spend in the winter is hitched up to a bar stool in Beedy's on Dungloe Main Street, enjoying the fruits of someone else's labors: baskets of steaming mussels, cockles, and razor fish that some of the regulars brought in and boiled up in the kitchens for everyone to share. No fancy sauces or cutlery. You winkle the fish from their briny shells with your fingers and wash it all down with pints of black velvet. As Young Dave, Beedy's bar-owner, says with a laconic lift of his right eyebrow: "Sure, where else would you get it?" I'm afraid we are ruined for city life.